Once upon a long time ago, I so badly wanted to be an investigative journalist. Now, films about good journalism fascinate me. Especially true stories. Anyone who’s reading the news knows the state of my adopted country. It’s not hidden from the rest of the world. As the US faces its most divisive age in years, people who know their history hark back to another dark period in the country’s history. McCarthy attacked the fundamental freedoms of US citizens and used lies as a weapon to destroy them. Against him were arrayed men who believed in those very freedoms, and who used the truth to vanquish the senator. One of those men was American journalist Ed Murrow, famed for his war-time broadcasts from London, who signed off his Christmas broadcast of 1940 with the words, ‘So long, and good luck.’ Later, he used the variation, ‘Good night, and good luck’ as a signature phrase. After the war, Murrow came back to became the vice president of the Columbia Broadcasting System (CBS), later reverting to being just a newscaster. These are the two men who become the unlikely leading men of director George Clooney’s narrative. Good Night, and Good Luck. opens with Edward Murrow’s (David Strathairn) speech to the Radio & Television News Directors’ Association on October 25, 1958. [Much of the speech is taken, note-for-note from the real Murrow’s speech at the RTNDA convention.] In it, he talks about the responsibility of the media, and the innumerable problems that face the fledgling world of television broadcasting. McCarthy responds by accusing Murrow of having communist sympathies himself. This then, is the event that sets into motion the broadcast that will severely damage Senator Joseph McCarthy’s credibility, and combined with the concerted effort from other journalists and broadcasting corporations, bring about an end to the career of an infamous politician who used fearmongering to suit his own political ambitions. Almost in documentary mode, Good Night, and Good Luck. chronicles the early days of broadcast journalism as seen through the eyes of Edward Murrow and a hard-working, close-knit CBS staff, including Murrow’s producer Fred Friendly (George Clooney) and reporters, Joe Wershba (Robert Downey Jr.) and Don Hollenbeck (Ray Wise), backed by William Paley (Frank Langella), chief executive of CBS. The film takes a chilling look at the atmosphere of fear that is created by focusing on the indescribable threats to American freedoms from persons within and without. In doing so, it also shines a light on the efforts to muzzle the press, the relationship between corporations and journalism, and the fine line between freedom of the press and the balance sheet. As both a political drama and a social commentary, the film’s focus is narrow – it is a short period in American history that is under scrutiny, and even so, only certain events. It takes for granted that people who watch the film know their history, and therefore does not spend time explaining its background, or the real-life characters who people the screen. It is not so much about McCarthyism as it is about two men (of the many) who worked together to bring about his downfall. It plunges us straight into the claustrophobic confines of the 50s newsroom – where desks are smack up against each other, and the producer has to kneel out of sight to tap the newscaster to give him his cues. The air is thick with smoke and in fact, Murrow continues to smoke as he broadcasts live. The intensity of getting breaking news; the hurry to cobble together a telecast, to write on the fly as it were; the pressures the production team were up against – whether that be of time, or policy; they underpin the narrative and build up a tension that is communicated to the audience. One can, even without much imagination, understand the dangers that these men faced, as they investigated the most powerful in the land. The production values are excellent, and the fledgling days of television broadcast are brought alive on screen. It is a page from history. George Clooney, who also doubles as script writer (along with Grant Heslov), has meticulously researched the era, the personages, and the events. Clooney also did well to shoot the film in black & white, keeping in sync with the times in which the story takes place. [The film was shot in colour, and then desaturated in post-production.] Where it scores is in being even-handed, neither romanticising the 50s newsroom [the only women in the newsroom are sent off on errands; the jazz interludes by a black woman performer (Diane Reeves) are just that; fillers after every 23 minutes, which was the time of an average TV show], nor painting the CBS head in shades of black (only caring for his bottom-line) or white (being the righteous crusader using the power of the press to bring the mighty to their knees). The masterstroke was also in using archival material of McCarthy’s speeches and Senate hearings. Clooney also used archived footage of other interviews conducted by Murrow – all these lend a sheen of authenticity to the events unfolding on screen. The real Milo Radulovich was a consultant on the film, and hence, his story is the truest on record as the film tells it. That said, by using Edward Murrow as the arrowhead in the war against McCarthy, Clooney is only showing us one strand of history, leading to charges of ‘cherry picking’ facts to suit his narrative. Certainly, Murrow was an astounding journalist, and had cobbled together one of ‘the finest news staff anybody had put together in Europe’ during the war. Called ‘Murrow’s Boys’ [even though one of them was a woman, Mary Breckinridge], they were indeed the best and the brightest. When CBS began its television broadcast, Murrow’s ‘Hear It Now’ radio broadcast moved to become ‘See It Now’. One of the episodes was a report on Senator Joseph McCarthy. As in the film, Murrow used excerpts from McCarthy’s own speeches to discredit him. He and producer Fred Friendly put in their own money to produce the show. It is clear that this programme did much to erode the already-waning popularity of the Senator from Wisconsin. But. Murrow was neither the first journalist to bay for McCarthy’s blood, nor was McCarthy all-powerful when See It Now first aired its report on him. Both Republicans and Democrats had already begun to denounce the controversial Senator, and journalists from the Times had already been investigating him for months. The Chicago Tribune, the New York Times, et al had been covering McCarthy, and ABC’s airing of the Army-McCarthy Senate hearings [post the Murrow show] was the final nail in his coffin. But that is a minor peeve in a film that is as beautifully mounted and crisply staged as this one. It is not just the lighting, the play with light and shade, highlighting Strathairn’s chiselled features, or the dusty, smoky atmosphere in which much of the film is shot. It is in the casting, from Patricia Clarkson and Robert Downey Jr. (in a sub-plot about a married couple who have to keep their marriage hidden because CBS policies forbade two colleagues to marry each other), to Ray Wise (in another sub-plot dwelling on the attacks led by William Hearst's newspapers on journalists who dared to criticise McCarthy, leading to Hollenbeck's tragedy), Frank Langella, David Strathairn, and Clooney himself. In one scene, McCarthy is shown quoting Shakespeare: “Upon what meat doth this our Caesar feed, that he is grown so great?" At the studio, Murrow looks across at Friendly, and dryly remarks, ‘Had Senator McCarthy looked just three lines earlier he would have found this: ‘The fault dear Brutus, is not in our stars but in ourselves...’ ” Murrow will go on to repeat Cassius’ line at the end of his feature on McCarthy. Murrow is not God. He does not claim to be; he’s fearless, certainly, but he’s not without his flaws. In one of the most powerful scenes in the film, Paley points out Murrow’s own culpability. Perhaps the film’s greatest contribution is to the ongoing debate about civil liberties, and about the responsibility of the press in a robust democracy. More than a decade after this film was made – and the reasons for making it were pertinent then – we are facing one of the greatest battles against the curtailing of our civil liberties. When we sacrifice the very freedoms of other people that we are claiming to protect for ourselves, then ‘freedom’ loses its meaning. We need the Press more than ever, a free, fearless Press to be our watchdogs, to focus on what we need to know, and to hold those in power accountable. In an interview given to Mother Jones on the eve of the film’s release, Clooney had this to say: The more footage of McCarthy and Murrow we pulled, the more we realized how prescient this material appears—not just in terms of the government, but the Fourth Estate, too. He said he found it stunning how the events of the 50s were as relevant in 2005 (he was talking about the Patriot Act). It is even scarier to realise that more than a decade later, it is still relevant. Even more so, perhaps. Edward Murrow was talking about Joseph McCarthy, but it all sounds dismayingly familiar, more than six decades later. 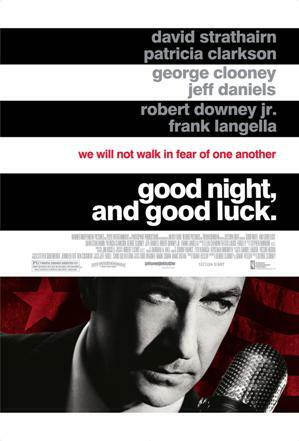 Posted by Anuradha Warrier at 16.2.17 Labels: 2005, and Good Luck, David Strathairn, Edward Murrow, Frank Langella, George Clooney, Good Night, Jeff Daniels, Joseph McCarthy, Movies: English, Patricia Clarkson, Ray Wise, Review, Robert Downey Jr.